Despite not introducing any significant new products during the second quarter of its fiscal 2014 ended in March, Apple has announced unexpectedly healthy revenues and profits for the quarter, with the all-important earnings per share numbers crushing analysts' expectations. Cook & Co.'s revenues for the quarter, announced on Wednesday after the markets closed, were $45.65bn. Net income came in at $10.2bn, and the metric to which the Wall Street moneymen pay close attention, earnings per share (EPS), was pegged at $11.62. "We're very proud of our quarterly results, especially our strong iPhone sales and record revenue from services,” said CEO Tim Cook. "We're eagerly looking forward to introducing more new products and services that only Apple could bring to market." Apple also announced that it will significantly increase its program of returning capital to its investors to $130bn, including share buybacks and dividend payments. It also plans a seven-for-one stock split for June 9. The Wall Streeters' pre-release expectations were much more modest. The average EPS estimates by the 47 analysts surveyed by the Thomson Financial Network and reported by Yahoo Finance came in at $10.17, with a low estimate of $9.65 and a high of $10.69. Apple's EPS for the year-ago quarter was $10.09. NASDAQ.com reported slightly more optimistic EPS predictions, citing a survey of 23 analysts by Zacks Investment Research that put the consensus at an average of $10.21. FactSet's analysts prognosticated an EPS of $10.19. Over at CNNMoney, longtime Apple-watcher Philip Elmer-DeWitt reports that the 40 analysts he heard from projected a higher consensus EPS of $10.33, "but mostly because Apple has purchased enough of its own shares to lower the denominator in E/S from nearly a billion shares to less than 890 million," he said. It turns out that Apple did far better than the "experts" expected – its EPS of $11.62 grew by 15.2 per cent over the year-ago quarter. Yahoo Finance's 47 seers saw revenues to be $43.55bn, with a low guesstimate of $41.76bn and a high of $44.50bn. Elmer-DeWitt's revenue numbers averaged a smidgen lower than Yahoo's at $43.53bn. The FactSetters were looking for $43.7bn. Apple's revenues for the year-ago quarter were $43.60bn, so Yahoo and Elmer-DeWitt's analysts were expecting a drop in sales of a tenth of a per cent plus noise, while FactSet was expecting a rise of a bit over two-tenths of a per cent. Apple's $45.65bn in revenues exceeded even the most optimistic consensus – and was even higher that Elmer-DeWitt's most optimistic analyst, who had predicted $44.75. Last week, CNNMoney's Elmer-DeWitt reported a broad range of estimates for iPhone and iPad sales, with his stable of analysts projecting sales of the smartphone to be between 34.05 and 42.5 million – Apple sold 43.7 in the quarter – and of the fondleslab to slip from 26 million during the holiday-season quarter to somewhere between 15 and 21.8 million. 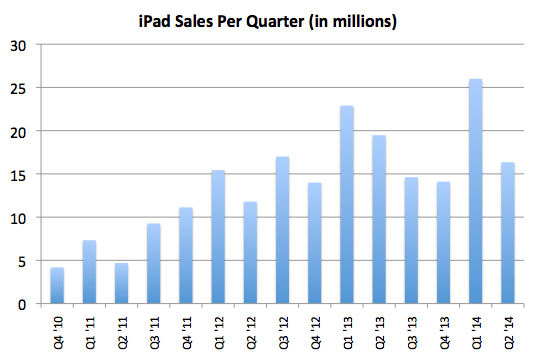 The iPad sales of 16.4 million didn't reach anywhere near that top range, but did beat the most pessimistic estimates. When Apple announced its financial results for the first quarter of its fiscal year this January, it projected that revenues for the quarter announced on Wednesday would come in at somewhere between $42bn and $44bn. Although Apple's earnings for that quarter were more than respectable, it was this cautious "guidance" that prompted the Wall Street moneymen to dope-slap its stock after the January announcements. 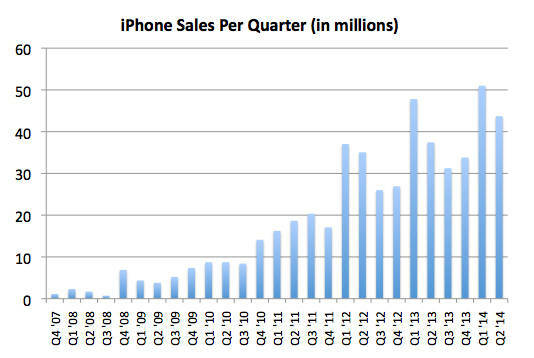 What was particularly interesting about that January meltdown was the fact that during Apple's B.C. years – "Before Cook" – Steve Jobs was notorious for lowballing guidance numbers, presumably so he could crow that Apple had blown past them. During the conference call after revealing that quarter's results, however, Apple's soon-to-no-longer-be chief financial officer Peter Oppenheimer announced that the company would no longer provide a single guidance figure, and hinted broadly that past guidances had been, well, a wee bit misleading. "In the past we gave you a single point estimate of guidance that was conservative that we would achieve," he said. "We're now providing you a range of guidance that we expect to report within." Wednesday's "range of guidance" for Apple's third fiscal quarter of revenues to be between $36bn and $38bn seems to indicate that Cupertino expects no new revenue surge for a quarter during which revenues declined in the past two years – and during which no new major products debuted. 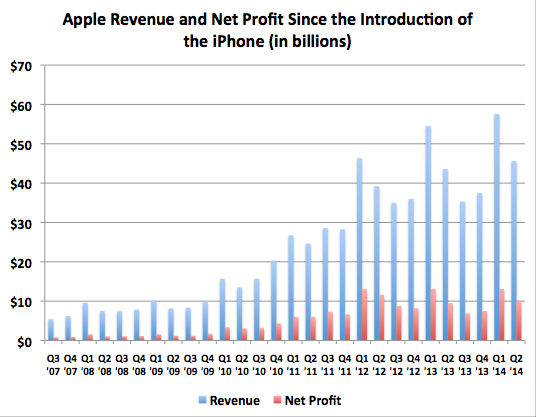 Apple's revenues for the third fiscal quarter of 2012 were $35bn, and for Q3 2013, $35.3bn. With a mid-point guidance of $37bn for Q3 2014, Apple seems to be signaling that normal seasonality and moderate growth will be the order of the quarter. To be sure, when Tim Cook takes the stage for his keynote address at Apple's Worldwide Developers Conference on June 2, he may very well unveil iOS 8 and may also tease some future hardware releases, but a guidance of $36bn to $38bn signals that there will be no significant new hardware released during Q3 2014 to goose the bottom line. Will Wall Street be content with stabilization and wait patiently for new products to pump up revenue numbers in the following quarters? After all, Cook has promised that not only new products but new product categories are on track for release later this year.